Symmes Inn was built on an exceptional site with a history going back several thousands of years. This exhibition recounts the various functions of this important location over the centuries. 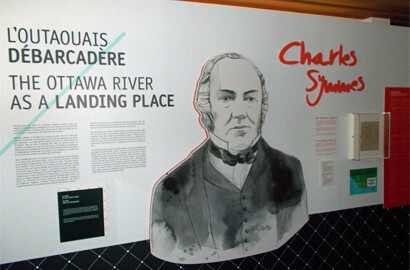 The building’s windows, many of which look onto the Ottawa River, invite visitors to discover the river’s past through notable historical figures and five themes: the river as a landing place, a busy waterway, a hive of industrial activity, a passage for steamboats and a leisure attraction.